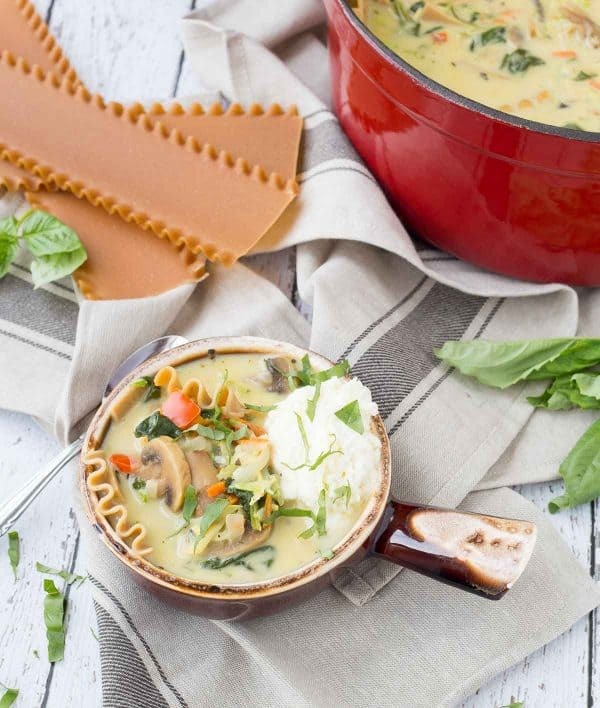 This vegetarian lasagna soup is creamy, comforting and packed full of vegetables. It’s all made in one pot and is the perfect soup for a cold day. The creamy base with the pasta and all those vegetables is just irresistible to me. This soup hits all those notes and it’s WAY better for you and easier to make. Okay, maybe not easier to make (it’s a frozen lasagna, after all), but it is quicker to make. 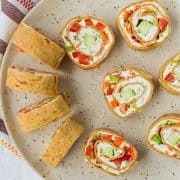 It comes together in about 30 minutes and it’s full of fresh and flavorful vegetables. Mushrooms! Spinach! Bell peppers! Onions! Zucchini! Summer squash! Carrots! 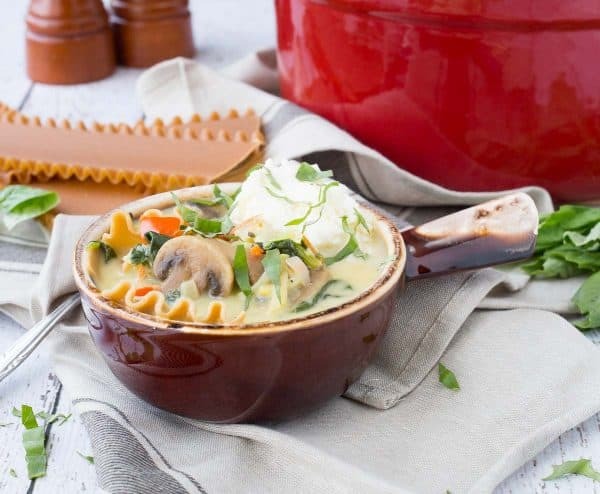 This vegetarian lasagna soup is a vegetable lover’s dream come true. It’s warm, cozy, and comforting and the perfect thing to add to your soup repertoire. I used whole wheat noodles and half and half (instead of heavy cream) so it won’t break the calorie bank, either. My favorite part? The dollop of cheesy goodness on top – a mixture of parmesan, ricotta, and mozzarella. Thank goodness for cheese, ya know? 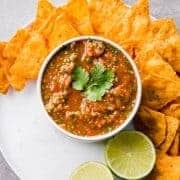 PS: If you want a couple more great ideas for vegetarian soup recipes, try slow cooker tomato basil soup with tortellini, copycat Panera squash soup, red lentil soup, or slow cooker minestrone with quinoa. 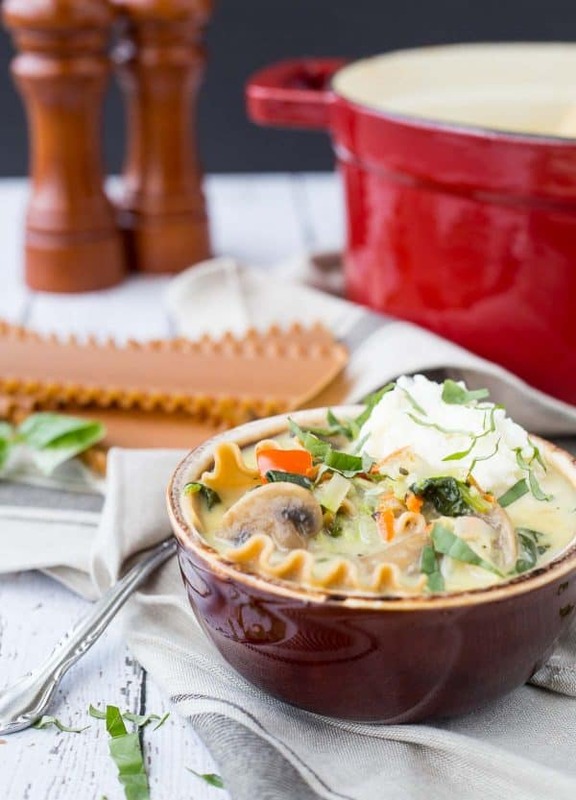 Watch the video to see how to make this Vegetarian Lasagna Soup! In a large pan, heat oil over medium-high heat. Add onions and peppers. Cook until onions are translucent. Add mushrooms. 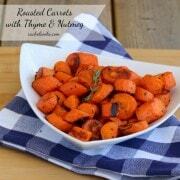 Cook until browned and then add carrots and garlic. Cook for 1-2 minutes or until garlic is fragrant. Add spinach and dried herbs and cook until spinach is wilted. Add broth and water. Bring to a boil and add pasta, stir. Cook for 9 minutes or as directed on package, stirring frequently so pasta cooks evenly..
Once pasta is cooked, add shredded zucchini and summer squash and cook for 1-2 minutes, adding more water as needed – remember you’ll be adding more liquid when you add the half and half. Remove from heat and slowly stir in half and half. Return to low heat if desired. In a small bowl, mix together ricotta, parmesan, and mozzarella cheese. Top individual bowls of soup with a spoonful of this mixture immediately prior to serving. Garnish with basil if desired. Verdict: I loved this cozy vegetarian lasagna soup — a healthier take on that classic vegetarian lasagna I can’t get enough of. Husband’s take: He’s automatically a little hesitant towards anything vegetarian but he loved this soup! Changes I would make: None are necessary. If you don’t have all the vegetables, that’s alright. It will survive without one or two of them, or you could substitute other favorites like broccoli or green bell peppers. 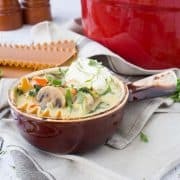 Love the idea of lasagna soup! This soup looks absolutely amazing!!! That is the ultimate comfort food soup!